It's that time again and it's always a most enjoyable experience and this time is no exception. Alicat & Sara's asked us to prepare something involving Easter Breakfast and/or Brunch for their latest Weekend Cookbook Challenge. 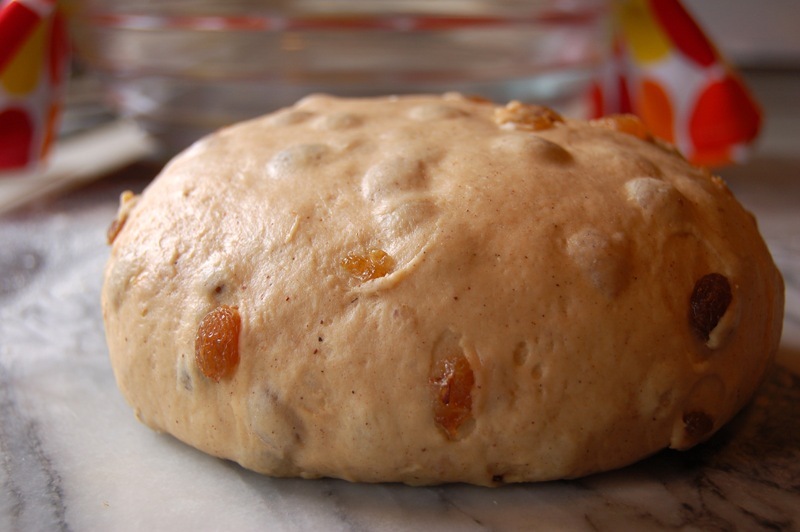 I had intended to make the traditional Colomba di Pasqua but I was unable to find any of the proper moulds so I decided to take a leaf from Paalo's English tradition and make the ubiquitous Hot Cross Buns. 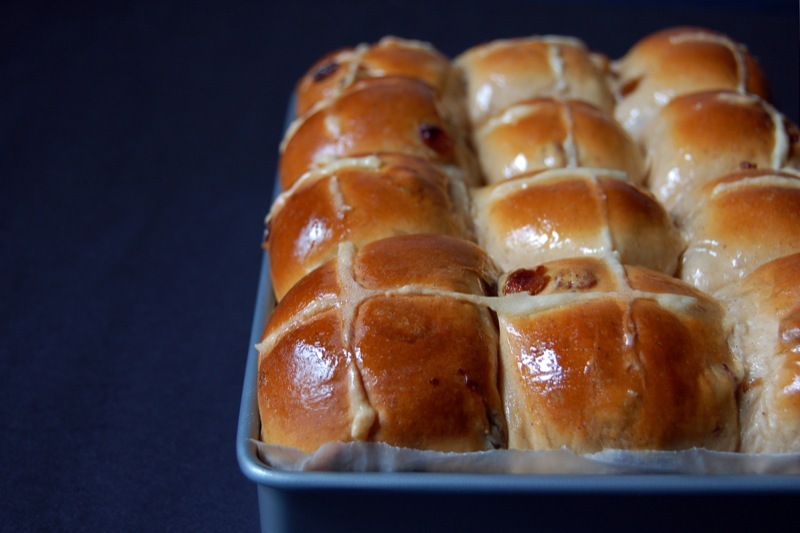 Hot Cross Buns are typically eaten on Good Friday (though we have them toasted for breakfast on Easter Sunday), so there's still time to whip up a batch if you are so inclined. The recipe I'm using comes from "Modern Classics 2" by Donna Hay, though I have made some modifications to the recipe and some of the techniques. I do have to confess that I dislike mixed peel with a passion so there is none in the batch that I made though it's quantity is listed in the recipe. 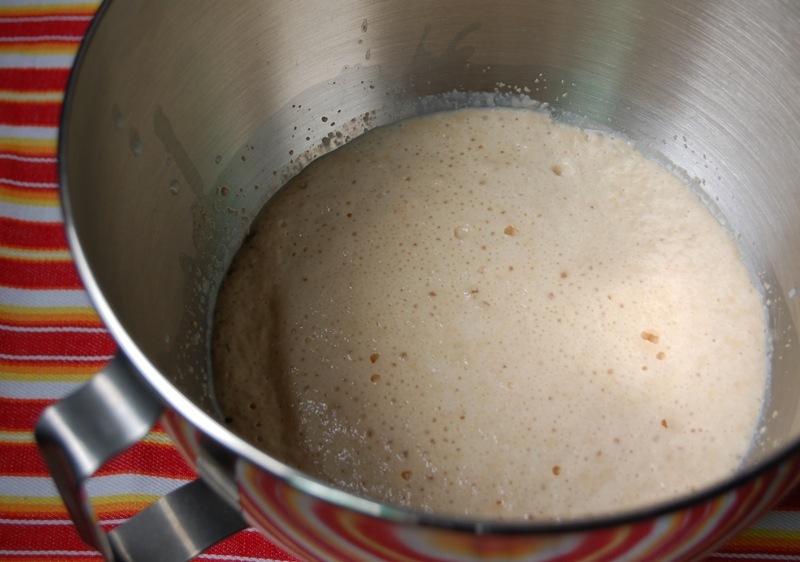 Place the yeast, 2 teaspoons of the caster sugar and all of the milk in a bowl and let it sit for 5 minutes to make sure the yeast is activating. Sift the flour with the mixed spice and cinnamon. 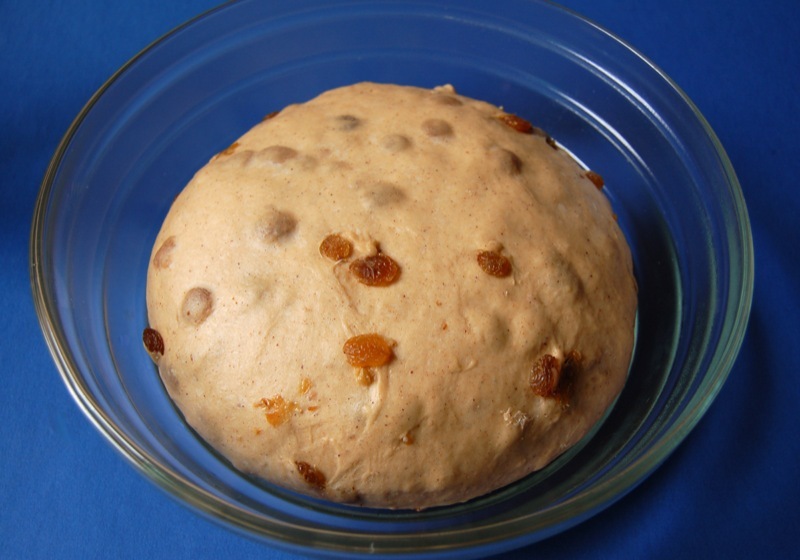 Add this to the yeast mixture along with the butter, remaining sugar, egg and sultanas (and mixed peel if using) - using the dough hook of the mixer and a low speed, mix until a sticky amalgamated dough forms. Take it out and place on a very lightly flour dusted bench and knead for about 5 minutes or until the dough is elastic and smooth. 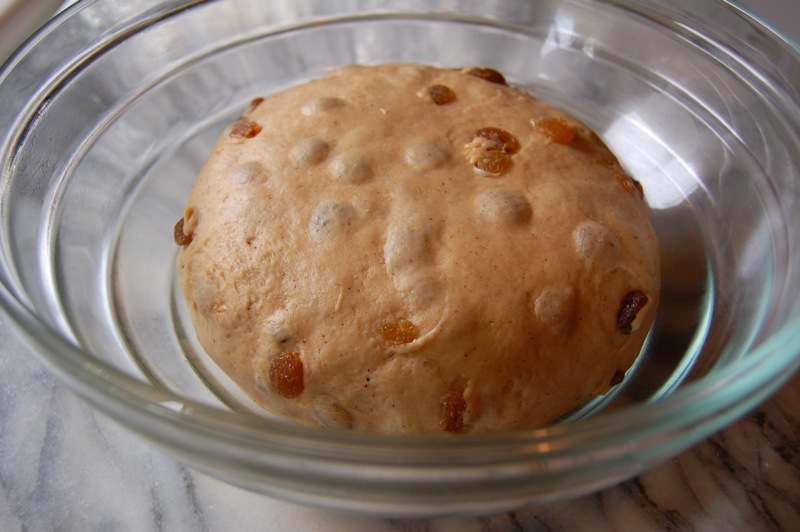 Place the dough in an oiled bowl, cover with a towel or plastic wrap and let it sit in a warm place for an hour or until it's doubled in size. When doubled in size, place the dough onto the bench and divide into 12 (either by eye or use scales). 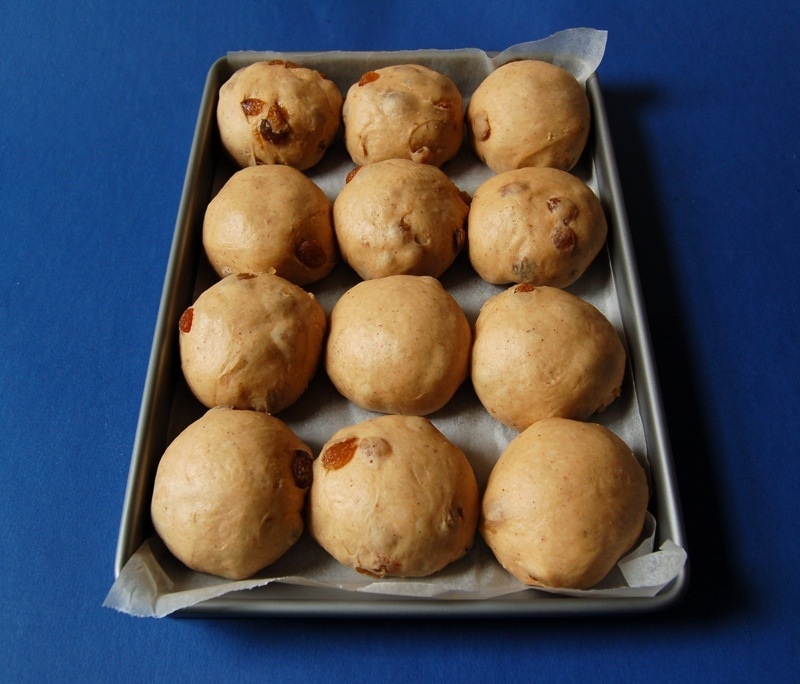 Roll each portion into a ball and place in a rectangular ovenproof tray, lined with baking paper (this tray is 19 x 30cm). You want a snug fit to encourage the correct shape to form. Cover with a towel or loosely placed plastic wrap and put in a warm place to rise again around 30 minutes to an hour. Once risen you can pipe the crosses over the top. Making the paste for the crosses. The original recipe produces enough paste to pipe hundreds of crosses so I've listed it as a ratio. 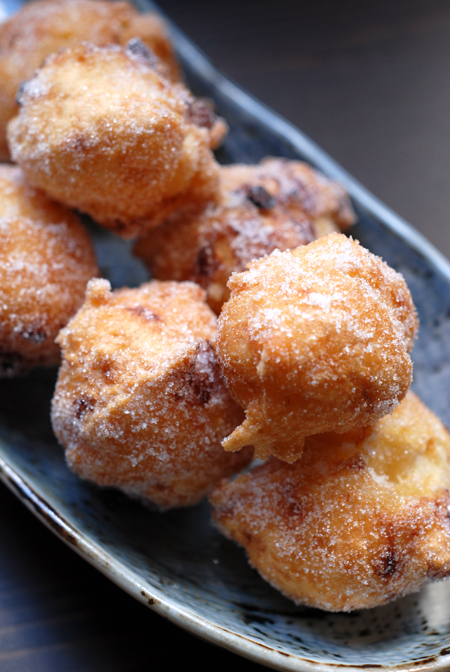 Mix together 3 tablespoons of plain flour with 2 tablespoons of water until it forms a sticky paste. Place in a piping bag fitted with a small nozzle and starting from the edge of one bun, pipe a straight line along the centre. Repeat this four times on the horizontal and then four times on the vertical. There's no need to be too precious with the piping as it is quite a sticky and difficult paste to work with. Other recipes will have you forming a drier paste and rolling out cross shapes but I find that they are too hard and are usually pulled off rather than eaten. Once piped, this is placed in a preheated 180°C/350°F oven for 25-35 minutes (once again time is a variant depending on your oven type). You want the buns to be golden brown and well risen. The final part is the glaze. The original recipe calls for one that involves gelatine and seems a tad convoluted so I've chosen to use the equally effective but simpler, sugar syrup. In a small pan place two tablespoons of sugar and one tablespoon of water and heat until the sugar dissolves and the liquid thickens. Brush this hot syrup generously over the tops of the hot buns. Either eat them still warm from the oven or toasted with butter. Hot cross buns! What memories... Your photos are really great, I have to say! Don't know how you do it. BTW, does one win anything in the Weekend Cookbook Challenge? Thanks Ali - it's such a great event I can't miss it! Thanks Susan - there's no prize or anything, it's just a whole lot of fun! I just sat down to check the food blogs while my Hot Cross Buns baked in the oven and I find your post for Hot Cross Buns. I used a recipe from The Complete Book of Baking, Landsdown Press, 1984. I hope mine come out as tasty looking as yours. 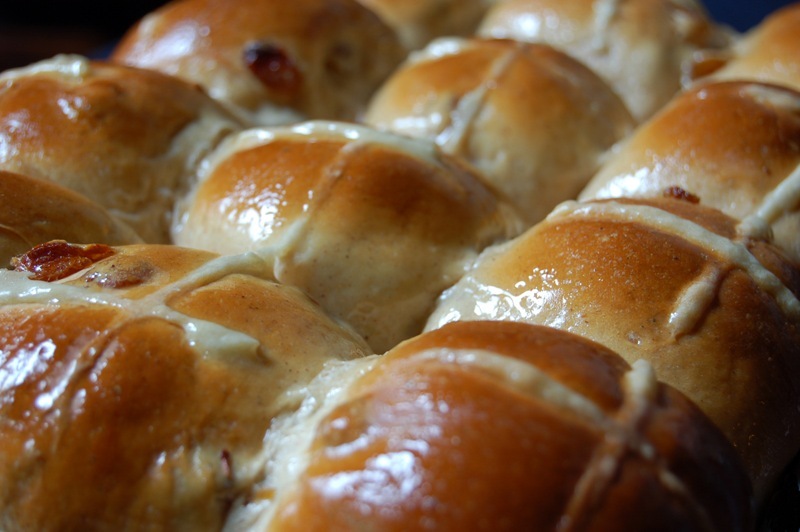 Hi Dave - Thanks for your comments - hot cross buns are one of those yummy specialities of the season. I just found your blog through technorati and the WCC entry. These buns look incredible! Well done! Thanks Melanie - I hope you enjoy making these for Easter. thank god I found your blog, I was looking for the recipe of my youth, it appears yours has all the right stuff - even the peel (which I don't mind) Yay! was horrified with icing crosses and other weird ingredients. gues that is the australian in me. Hi Anon - I do hope you enjoy making these, I haven't been able to find a better recipe than this one - it works marvellously. Hope you enjoy them Arundati! Thanks Nandita - that's a great adaptation, very clever use of flaxseed to replace egg. They look great too! 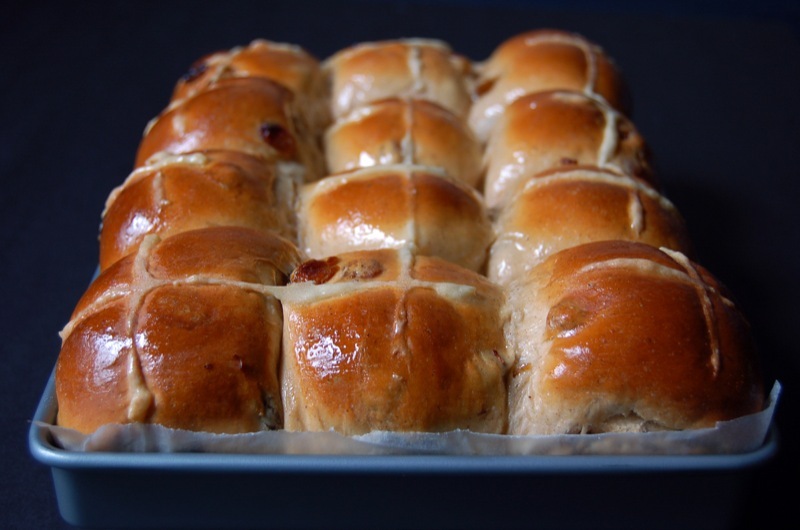 Hey Haalo, I just made these hot cross buns last night and they were splendiferous!!! Looked just like yours and tasted absolutely deliciouslydelectable!! Thanks again for another fab recipe. Have been lurking for a long time, and will use this occasion to come out of hiding. 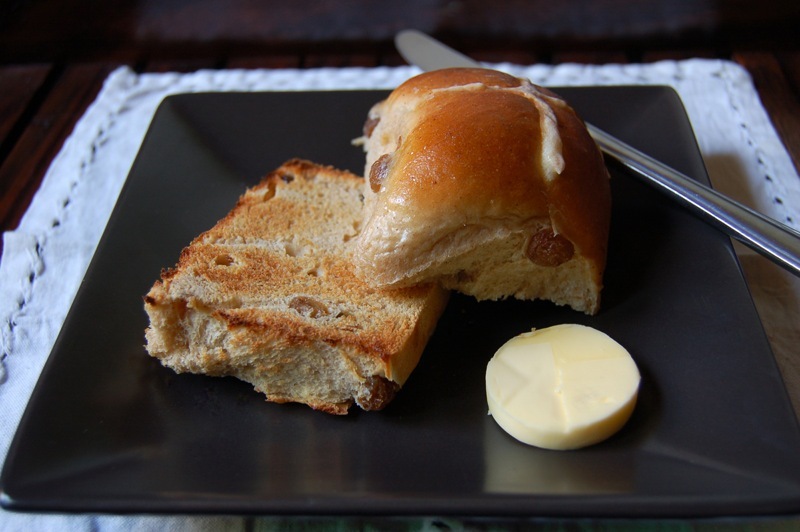 I've baked several of your recipes before, and used this one for an afternoon tea on Good Friday. The result was wonderful straight from the oven, and the leftovers have been great for breakfast toasted. Thanks Deb - that is fantastic news! Welcome Lauren and thank you - I'm very happy to hear these buns have worked so well. 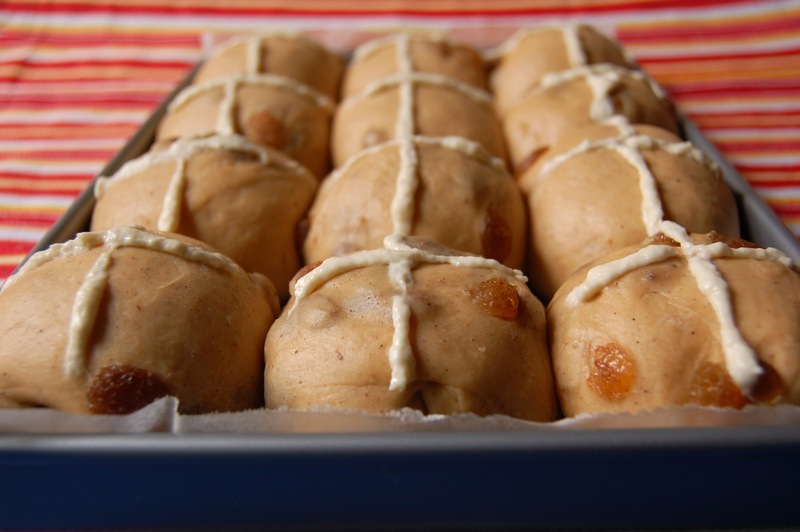 They are such a lovely thing to have on Good Friday and even more so when they are home made. Thanks Arundati - they look great, well done! MMMMMM...Haalo!! I love this classic!! your version looks fabulously yummie 8) !!! Wine Blogging Wednesday #20: Anything but..